It’s generally held that historical memory is a straightforward ‘good’. Most of the standard justifications for historical study operate on that premise, combined with the nation that one needs to know about certain things – events – from the past (quite which ones being the subject of debate). Historical knowledge allegedly keeps us from repeating the mistakes of the past, though it’s difficult to imagine a more empirically-obvious falsehood than that. Most societies did not record or commemorate their history in anything like that sort of ‘factual’ way and yet functioned perfectly well, or at least no worse than those that did do so. If ‘history’ existed in such societies it did so in other forms more akin to myth. Myth plays an important role in society but it does so not on the basis of the kind of factual, empirical knowledge about what did or didn’t happen upon which the sorts of modern justification of historical study just mentioned are based. Whether or not battle, war, king or queen X ever existed is irrelevant to the point of a story that serves principally to illustrate concepts of honour, shame, loyalty or courage. The claim that society needs historical memory (as understood in the modern West) is a very long way from being established and seems to me to be difficult to sustain. That may be an odd thing for a professor of history to say. Odder still might be my suspicion that we might not be worse off to let historical memories slide out of popular consciousness. I am probably not the only person who has got more than a little sick and tired of all the Second World War nostalgia being spouted by Brexiters (none of whom, let’s remember actually fought in it or, in most cases, was even alive during it). The idea that ‘we’ won the war is of course easily challenged. Leaving aside the considerably greater roles played by the USSR and the USA, even ‘Britain’ was not simply ‘us’ in a Second World War context: ‘British armies’ contained large contingents from ‘India’ (that is the pre-partition South Asian sub-continent), Australia, New Zealand, South Africa and Canada, as well as the sizable contributions from Free French, Greek, Norwegian, Czech, Polish and other forces in exile from their occupied homelands. There’s obviously a role for historians, broadly defined, in stepping in to confront these narratives, just as in the States historians have tried valiantly to combat the rewriting of the history of the southern Democrats, which has attempted to make the Democrats the party of racism. But there are limits. Contrary to one recent newspaper opinion column, the historian is not, and has better things to do than being, simply the guardian of the national narrative. As I have repeatedly argued in this blog the importance and value of Historical study lie ultimately in the doing, not in the knowing. More importantly, the combat of history and myth can be hopelessly unequal. Facts are a poor instrument with which to combat myth, for the simple reason that, as I said earlier, facts are not important to myth. The importance of myth lies in the feature of contemporary/contemporaneous society that it seeks to render natural and immemorial. Transposing some elements of Žižek’s critique of responses to racism/antisemitism (and it’s the same problem one has in dealing with conspiracy theories), facts operate in the register of the Symbolic (things as they are; representation; the signifier) but Myth operates in that of the Imaginary (the ideal, the how things should be; the signified). If the mythic element of this kind of quasi-history seeks to eternalise an opposition between plucky Britain/England (plucky Scotland and plucky Wales have their own myths) and oppressive continental Europe, which is somehow foundational to the identity of a generation of mostly English, mostly white, mostly male Brits, then simple facts are going to find displacing that a tough battle. Something transcendent about that ‘Britishness’ will always escape the ‘facts of the matter’. The problem is the very identification with a past; the ‘we’ in the ‘we won the war’ (there’s a good Mitchell and Webb sketch that mocks those sorts of first-person plural identifications of people not involved in something with people who were). A few posts back I discussed the then-recent furore over Winston Churchill’s reputation or legacy. The reason why that discussion is always so heated is because it lies in the same region: the interplay between ‘factual History’ on the one hand and identity and ‘Myth’ on the other. A challenge to the idealised figure of ‘Winston’ is seen as a challenge to the very identity of a particular kind of British citizen; it’s to cut them adrift from some sort of fixed point of ‘pluck’, defiance, heroism, etc. Alas many of these kinds of fixed point involve a ‘them’ as well as an ‘us’; and thus eternalise and naturalise an opposition (see WWII). This is why think that one of the things that History should do should be instilling the idea that the past, even the recent past, is irredeemably ‘other’. We are not them; they were never us. This point is in my view absolutely crucial to emancipatory, ethical historical practice, and it applies across the political spectrum. Thus, I think it not only applies to national or ethnic associations with the past but also to other types of identity: racial, gendered, sexual. The problem with applying modern classifications to the people of the past is that it naturalises and eternalises those categories, and the differences and oppositions inherent within them. As Emmanuel Levinas (to whom I have returned lately) said, to see the other in terms of the self is to view it in terms of mastery and totality. The ethical approach recognises the unmasterable infinity of the past, and the lives and experiences of it. That means letting go of the desire to recognise ourselves in the past. This is not to disavow the politics inherent in the study of the past, but to relocate them in a different part of the project. Now, as I have said before, that’s easy for me to say. As a cis, hetero, able-bodied, western, middle class, white male I have pretty much a full house in privilege bingo. For many other people there are as yet battles to be won concerning the recognition of a past. Nonetheless I think that that is the horizon that historical study should strive towards. I also think that one of the ways in which the battles I just referred to can be won is by those like me actively stressing that the population of the past was not ‘just like us’, not just in terms of norms or majorities but at all. The thought here is that by first evacuating the past of its dead white (straight, able-bodied) males who look like us, people like me might create a space for a more diverse and different past that seems not to belong to anyone. That the whole of the past should be of interest to all, equally, regardless of whether or not you see yourself in it (which is similar to what the early Fanon argued, before he realised that that was easier said than done). This would be my contribution to decolonising the past in western European/Mediterranean history. Perhaps this is naïve. I think it is worth an effort though. All of which brings me to the topic of historical apologies. This has been in the news recently in relation to the British Government’s apology for the massacre at the Jallianwala Bagh, Amritsar (Punjab), which occurred 100 years ago. I am not in general a big fan of historical apologies, at least for periods where the principals are all dead): I strongly believe that apologies tend to be cost-free, empty political theatre. Furthermore, they perpetuate the idea of past representatives of a modern country are to be seen as ‘us’ or ‘them’. There’s an inconsistency in demanding apologies for the actions of past governments, armies, employees, agents or citizens of a country as though the responsibility still lies with the citizens, agents, government of that country and it is this: if one is expected to feel shame for the actions of one’s forebears, then one surely can feel pride in their achievements too. But if that is the case then it becomes difficult to critique the likes of Mark Francois (or Marc François as I like to call him) and his War Studies bluster. If ‘we’ committed the Amritsar massacre, then ‘we’ won the battle of Waterloo too (and if ‘we’ at Waterloo were actually mostly Germans and Dutch, then ‘we’ at Amritsar were – partly – Ghurkas). If the crimes of the British past, the Atlantic Slave Trade, say, are ours to bear, then are the achievements of the British past not somehow exclusively ‘ours’ too? We are back where we need to start finding reasons why people other than white Brits might ‘also’ see this history as theirs. If the exclusive Britishness of those achievements can be mitigated then so too can the Britishness of the bad stuff. There’s no logically sustainable reason to distinguish between the two. If you insist that a past crime be ‘owned’ by a modern national category (or an ethnic or racial, or gendered category, or a combination of these) then, in the parlance of the lawyers in the Law and Order franchise, you ‘open the door’ to the ‘ownership’ of the ‘glories’ too. You end up back with the ‘balance sheet’, at best. This is why it’s more important to think about the event than the participants. Isn’t the logic of my argument therefore that it would have been better if there had been no commemoration and no apology. Mostly, yes it is and ideally that would have been the way it ought to have been. However, in the case of the Jallianwala Bagh, I think that some kind of public act by the British government could have been important. One of the problems of modern British society is that Britain hasn’t faced up to its imperial past, something which explains many things, of which Brexit is only the most obvious. Not confronting that past has allowed its persistence as myth. When I wrote about the referendum on the eve of the vote I tried to say that there was a visceral tug at the heart strings that even I might feel at footage of the Grand Fleet, of the might of the Empire manifested in battleships in line astern. People thought I was defending the Empire and I probably didn’t make my point clearly enough. What I was trying to say was that, while I appreciated that nostalgia (it was a cack-handed attempt to 'reach out' to the Brexiter), you had to think beyond the visceral, the mythic, to appreciate two things: that that world had gone and was never coming back; and also that the Empire and the global exploitation that enabled those battleships had hardly been a good thing in any case. Many nations have a difficulty facing up to pasts that have become mythic bases for identity. Apparently it’s Confederate History Month at the moment, for example. Italy has never properly faced up to its fascist past. As a German friend of mine who lived in (and loved) Rome said to me ‘you have to remember that Italy won the war’. The change of sides by the Italian Republic has allowed the Fascist state to somehow be put to one side. You can see the myth of the ‘liberation’ of Italy from German occupation. Fascist epigraphy is all over the place in Rome. The result is the myth that somehow Italian Fascism was ‘nice fascism’. The trains ran on time (actually they didn’t). And so Mussolini’s descendants represent Far Right parties in Italy (can you imagine any putative descendants of Hitler still bearing the family name, let alone standing as candidates for AfD?). For many, many years France was in a similar position, thanks to the convenient Republican myth that portrayed the Vichy State as an illegitimate interruption in the lineal descent of the French Republicanism (it wasn’t; the powers vested in Pétain were voted to him by the Assembly). Thus it was not until Chirac that the responsibility of the French state for its involvement in the Shoah was finally acknowledged. France has a way to go, as far as its record in Algeria goes, but it seems to be getting there bit by bit. Countries like Poland have if anything rolled back any admission of involvement in Nazi atrocity. The Imperial heritage remains untouchable in the UK; as the failure to remove statues of Cecil Rhodes in Oxford a couple of years ago revealed. All of the examples above show abundantly that attempts to confront the mytho-historical bases of national identity produce sometimes violent kick-backs. Enough with the guilt, say AfD. The French right-wing writer Pascal Bruckner has been arguing that the West has been subjected to the ‘Tyranny of Guilt’ since well before AfD came on the scene. I am (unsurprisingly) not sanguine that historical education in the usual sense (educating people about ‘the facts’; teaching them about different heroes from the national narrative) helps, at least in the short term. Over the long term perhaps it will; I am not sure. To confront the myth, does one require something that steps outside the world of facts? Do we require something more than apology? Let me try out an idea. I am not 100% sure it really works or even that I have fully thought it through but here goes. The historical apology, I said earlier, is usually an empty gesture that costs little and achieves as much. The demand for an apology is frequently the same: a simple act of political theatre aimed at a base, as is the theatre of publicly staying away from the ceremony or rejecting the apology. An apology, once given, rarely settles an issue. I often think the discourse goes like this. We deeply and sincerely regret these actions and the damage done. Your apology needs to go further than that. And so it goes on, essentially keeping alive a grievance, rather like a feud. Periodically it is reactivated so that people can line up behind the viewpoints that are in conflict (yes, I am thinking of Jacob Black-Michaud’s analyses of – especially Cyrenaican - feud as social structure, from the ‘70s). The dispute rumbles on with no hope of a solution but continues to serve a political purpose, on both sides. One wonders whether an apology can ever really put an issue like this to rest. Rather like a blood payment in true feuding societies (again referring to Black-Michaud), it does little more than signal a time-out, at best. The problematic ‘memory’ is kept alive, like picking at a scab till it bleeds. We continue to concentrate on the relative guilt, goodness and evil of the perpetrators and the victims rather than on the event and its general human significance. As I have argued before, the latter is what I think the object of the historical study of events like massacres should be. We are talking about speech acts and, as Derrida famously said, speech acts are problematic because they are iterable. The sarcastic apology can be identical to the sincere one and because of that the sincere apology can be heard as a sarcastic one. No one can ever prove that a sincere apology wasn’t sarcastic or vice versa (here we are back to the history of the lie). Perhaps the issue with the historical apology is that the initiative rarely if ever comes from the representatives of the perpetrators. It usually comes from the (historically at least) weak to the powerful, from the heirs of the victims to those of the perpetrators. You don’t see demands for apologies from Britain for, say, the Kanpur Massacre – not least, of course, because Indians paid for that at an exorbitant rate of interest not just in the late 1850s but, as Kim Wagner has demonstrated, for generations afterwards. That’s a bad example but I hope you get my general point. That dynamic, surely, keeps alive the original power relationship. In a world (such as may in some views not be all that far off) where powers in the ‘global south’ have come to dominate the West economically it’s difficult to imagine the discourse over the Jallianwala Bagh taking its current form (in that hypothetical future, if that form of global imperialism replicated its precursors – though there’s no necessary reason to suppose it would – we would be more likely to see statues of Tatya Tope and the Rani of Jansi outside British factories than demands for apologies). Let me then suggest something slightly different. Rather than apologising, perhaps what we need is a public act of asking for forgiveness from India. Just as the act of forgiveness cannot be conditional, the act of asking for forgiveness cannot be dependant upon expecting to receive it. Such an act however does reverse the roles; it puts Britain in the role of supplicant. For that reason and others it therefore costs more than the simple apology. I suggest that it is therefore possibly a better way of confronting the Imperial past and uprooting it from its mythic position (where the signified of the British Empire is the British government as supplicant asking forgiveness). As an act it has, I think, greater potential to unite the two parties. Unlike demands for apology, demands for forgiveness can’t go on and on being repeated without their force being entirely undermined. In the face of asking for forgiveness, demands for apology cannot be endlessly repeated either. The plea for forgiveness and, if granted, the act of forgiveness, are one-offs. For that reason, it just might bring about something like closure. We can then think about the Jallianwala Bagh massacre as an event, typologically, in its general human context rather than being distracted by issues of blame and guilt that are rooted in political myth. As I argued before, historical events, unlike dead historical actors are something that historians have to judge ethically, as well as explain (in this regard I disagree with Kim Wagner). In that way, I would like to argue, we can think with the past in the present, while breaking free from the chains of myth and identity. * I would just like to pause at this point to suggest that this might be the first time where allusions to Derrida and Stevie Wonder met in the same sentence. Jacques Derrida, On Cosmopolitanism and Forgiveness (trans. Mark Dooley &amp; Michael Hughes). London. Routledge, 2010. Richard Holloway, On Forgiveness: How Can We Forgive the Unforgiveable? Edinburgh. Cannongate. 2002. David Rieff, In Praise of Forgetting. Historical Memory and its Ironies. New Haven, Conn. Yale University Press. 2014. Allow me to try out some thoughts that I am trying to put in order as part of my argument about there being an inherent ethical demand within history. This is probably going to be a bit rough and ready - or incoherent if you prefer. Sometimes it helps me to get things a little clearer in my head to try them out here. I began an argument some posts ago about how history operates on the basis of faith. Whether your source is lying (as opposed to being erroneous): Historians are frequently confident that they can detect a lie, but the confidence is entirely misplaced. Whether your source is being straight with you (this encompasses both of the above). Whether you like it or not, the facts of all of those matters are secrets that the authors of your evidence took to their graves. These points could - and indeed ought to, if one were proceeding on rigidly positivist lines - prevent anyone from writing history. We proceed in spite of them, whether you like it or not, on the basis of faith, or trust. The whole historical project begins from a leap or act of faith. In a sense in cannot be more than that. In normal conversation we proceed on an assumption of good faith, on the basis of an unspoken contract. We assume our interlocutors are not lying, if for no reason than that we expect them to believe us. But there is no such contract involved in an encounter with the traces of the past. Historians often speak as though we are in dialogue with our sources but, while the metaphor has pragmatic value, if examined closely it doesn't really work. Whatever contract of good faith was made by the producers of our sources, it was not made with later historians. The historian must - as pointed out above - approach the evidence on the assumption that it is going to be straight with her (that if it speaks truth it does so deliberately; if it lies it does so on purpose) but cannot expect anything in return. In that sense, in engaging with the sources the historian enters a space of heteronomy. A real dialogic engagement with the evidence is impossible; the engagements made by the different parties cannot but miss each other entirely. The faith that allows us to proceed is a faith, I argue, in the historical project itself. Think about some further irreducible issues of the production of history. No narrative is 'true'. A narrative is not a fact, even if it (as it at least ought to) proceeds on the basis of verifiable facts. A narrative can be wrong, for all sorts of empirical reasons (events in the wrong order, for example), but no narrative (unless it limits itself purely to a relative chronological list or chronicle) can be true. Narratives are all shaped selections; they are all ultimately fictions. No historical explanation is empirically verifiable. There is no way an explanation can be externally validated. A historical explanation is only ever more or less persuasive. The same applies to causation. We are accustomed to see events causing other events, but, as I have argued before, that is a mistake. Events come about because of unrepeatable constellations of circumstances and consequences, many of the latter entirely unintended. It can be argued then that historical knowledge - understanding history as more than the most basic cataloguing of events or regurgitation of contemporary views - is anything but concrete. I have argued before that historical research overwhelmingly continues on the basis that we are talking about solid empirical findings, even when aware of - even when accepting - the fundamental points made above. Too much historical debate is about who is right and who is wrong and conducted as though, when we get beyond the lowest level of empirical accuracy, such an argument were capable of resolution. That, it seems to me, is in bad faith. I have argued before that the very possibility of history lies within the empirical impossibilities I have listed. But if there are no concrete answers to be had (and there aren't) what is the historical approach about? One can answer that to some extent with reference to the things I set out in my 'Manifesto' but we can and should go beyond that. Yet, assuming that there is no transcendent 'truth' (i.e. a truth about progress, or reason, or spirit, or providence) to be had from history (I don't believe there is, but you might differ), then where do we go? This is where I return to my current bee in my bonnet, and the idea that we ought to think less about argument, rhetoric, winning debates, convincing people, and more about hermeneutics: interpretation and understanding. This is an approach every bit as wed to empricial bases, to method and to rigour; it's not a license simply for 'touchy-feely' statements of what X 'says to me' (but I don't necessarily want to rule that out); certainly not a permit to play fast and loose with the facts. Nonetheless, given that there is no attainable horizon of 'final' knowledge, we ought to embrace that. It seems to m to be more consistent with the act of heteronomy, vis-à-vis the evidence, mentioned above to avoid closing its 'voice' down. We need to keep open the (multiple) 'saying' (in Levinasian terms) of the evidence, and to allow equally multiple interpretations. Rather than trying to choose one reading or interpretation over another, perhaps we can keep them in play simultaneously, creating a more 'layered' effect. (I have an unfinished article that attempts to do this.) We should be less afraid of this. These things keep open a sense of dialogue without consensus (a Nancien 'unworked community' of historians). They keep open what I think is the most important feature of History, as a 'humanity', the understanding of different people, how and why they did things, and how and why they thought about things, how they fitted into their space with all the other, in some sense, non-human occupants of their world. It keeps the unreachable horizon open and inviting. The faith in the historical project lies in a commitment to continuing this unceasing movement towards that unattainable horizon. 'Lombard' Cemeteries Again: An Idea (or an Idle Thought). As I was reading about Italian settlement patterns in Late Antiquity I came across this map in one of the works of Angelo Castrorao Barba. 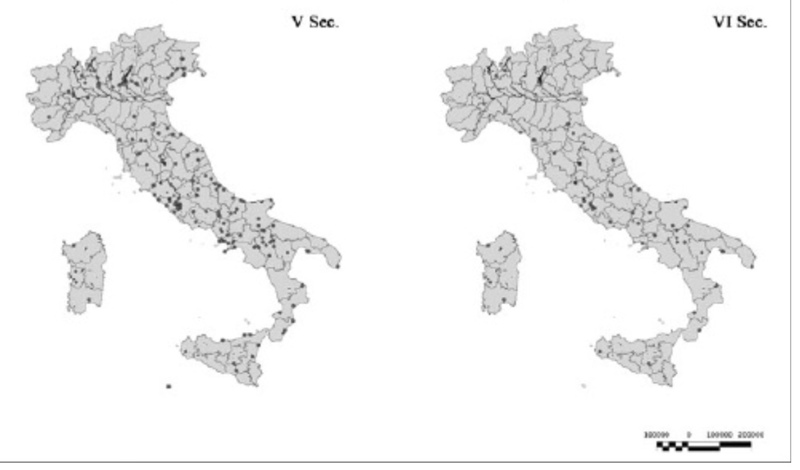 (1) Actually these two maps are just two of a series in his fig.2, showing the development through time of Italian villas from the 1st century to the sixth (one reason why the reproduction of only a part, below, is so blurred). Sorry this is blurry. I wanted to blow it up so that the peninsula looked a similar size to that in the other map. What I find interesting here is the fact that the 'Lombard' furnished cemeteries appear largely in the area in which the villa pattern had recently collapsed. The reasons for that collapse are usually pinned on the Gothic Wars of the mid-century, and it would be contrary, even by my standards, to deny that that must have played an important part, especially given that in some areas, such as southern Tuscany, the settlement pattern showed signs of recovery, under Ostrogothic rule, from some of the fifth-century decline. (3) [So much for the idea that economic decline in the 5th century was all down to barbarians...] That said, the dramas of the mid-sixth-century (plague as well as war) may not be the whole story. A comparative study of western Europe seems (to me - provisionally at least) to suggest that a new period in the development of the rural settlement pattern, opening around the middle of the sixth century, was not uncommon. The mid-sixth-century events might of course have played a role there too, and the 'direction' of change was not always the same; my point is simply that we might need to refine our interpretations to some extent. 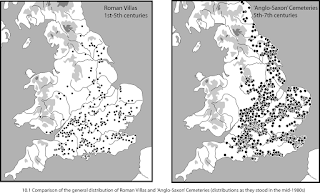 In various publications over the years, I have drawn attention to the relationship between the collapse of the villa system and the appearance of the rite of furnished inhumation cemeteries (burial with grave-goods). I have developed an interpretation of the latter burial rite as being fundamentally a sign of competition for local status, or at least of the tensions involved in transmitting such status from one generation to the next. As I have argued before(4) there are regional and chronological variations in the lavishness or competitiveness of the rite, and the extent to which it is practised by only a few families or whole communities, and whether the patterns of grave-goods distribution seem to stress élite family-membership or age and gender, and that this calibrates the interpretation as a sign of stress. Nonetheless, thus calibrated, that interpretation seems remarkably applicable throughout western Europe in the period between c.300 and c.700, especially when cemeteries viewed in a full archaeological context which includes the settlement pattern. 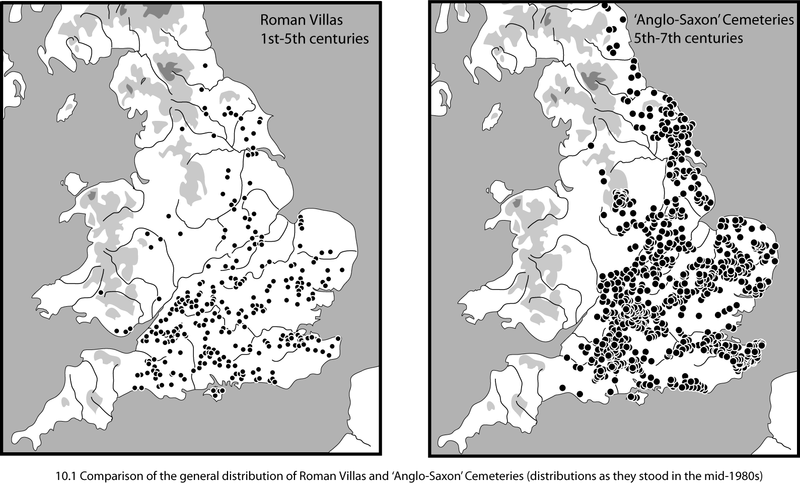 In the North-East of Gaul, the distribution of cemeteries maps very closely onto the distribution of the late (post-300) Roman settlement pattern (this has been demonstrated in exhaustive studies by Frauke Stein, though her interpretation could not be more different from mine(5)). In the Upper Danube valley, the distribution of 'Germanic' cemeteries also replicates that of the villae - thus located overwhelmingly on the formerly Roman territory. The precise relationships at the very local level may differ but the general pattern can also be illustrated in Anglo-Saxon England (see below, from Worlds of Arthur). All of the instances just cited, however, belong to the fifth and early sixth centuries. The villa system collapsed earlier in the northern provinces than in Italy, and furnished inhumation cemeteries appeared earlier too, as (in my view) a consequence. So it's interesting to see the appearance of furnished burials after the Gothic Wars(6) in the fertile Po valley, where a social system based round the villas had but recently withered away. This does seem, provisionally at any rate, to suggest the same sort of pattern as has been detected in the northern and north-western provinces of the former Empire. So. What are we looking at here? First of all we have the collapse of the antique settlement pattern in the region. Now, as far as I can tell, Italian villas show a long period of transformation through the fifth century, rather than the fairly rapid process of collapse that one can detect in the north of Gaul, the Rhineland or Britain. That surely implies some different explanations. I remain convinced that the collapse in the north-western provinces was very much to do with political instability and economic constraints consequent on that. The developments further south (whether in southern Gaul, Iberia or Italy) seem to represent something different. The villas survive longer, as villas, but their productive functions increase and their 'traditional' residential features decline. (7) Sometimes they become sites of, or are swallowed up into, the larger communal settlements ('villages' as they are termed in Italian archaeology) for which they had been the foci. Sometimes religious buildings appear on the old villa site, as well as burials. Nonetheless it's possible that, although being renegotiated and redefined, traditional local social hierarchies - including long-standing aristocracies - remained in place. As has long been well-known, though, the Gothic Wars were catastrophic for the traditional Italian social hierarchy and the developed, modified, even recovering, settlement-pattern of antiquity disappears quite dramatically, it seems in the second half of the sixth century. That must have created social stress. This stress can only have been emphasised by the Lombard attacks and especially by the failure of the Lombards rapidly to conquer the whole peninsula and impose a centralised kingdom on the pattern of that of the Ostrogoths (that failure probably linked partly at least to the collapse of established local social hierarchies, just mentioned). A series of political identities was available in post-Justinianic Italy. Clearly there were new families, and new local military powers, moving into the Po valley. Some families competing for local might well have allied themselves with the incomers; others perhaps not. Local families trying to fill the 'vacuum' left by the collapse of the traditional social hierarchy might well have chosen the new Lombard political identity. Wherever one is, though, it seems to me that one is better placed to understand the appearance of 'Lombard' cemeteries and grave-goods in this context of local competition for authority, or stress in maintaining existing preeminence. Analyses of some of the better recorded 'Lombard' cemeteries have shown similar age and gender-related patterns of grave-goods distribution to those I identified in Frankish necropoleis thirty years ago, and a similar interpretation probably applies. Clearly, incomers wree an important element in this situation but I maintain that they do not explain the appearance of furnished inhumation and that, even where such families did bury their dead in this way, that fact was more linked to the local socio-political conditions than to the simple fact of an ethnic affiliation. Clearly, though, this provisional interpretation needs to be looked at in more detail on the regional and local scale, looking at the precise uses of villa sites, and also at the full range of inhumation models. (1) Angelo Castrorao Barba, ‘Ville romane e riusi tra Tardoantichità e Altomedioevo: per un bilinacio nazionale’, in F. Redi & A Frogione (ed. ), Atti del VI COngresso Nazionale di Archeologia Medievale. L’Aquila 12-15 September [sic] 2012. All’Insegna del Giglio. Florence, 2012), pp.175-80. The map is figure 2. (2). From: Volker Bierbrauer, 'Die Langobarden in Italien aus archäologischer Sicht', in M. Hegewisch (ed.) Die Langobarden: Das Ende der Völkerwanderung. Katalog zur Ausstellung im Rheinischen LandesMuseum Bonn 22.8.2008-11.1.2009 (Primus. Darmstadt, 2008), Abb.11, p.119. (4). ‘Gräberfelduntersuchungen und das Ende des römischen Reichs’, in Zwischen Spätantike und Frühmittelalter, ed. S. Brather (Berlin: Walter de Gruyter, 2008), pp.103-17. (5). Particularly good maps in Frauke Stein, ‘Die Bevölkerung des Saar-Mosel-Raumes am übergang von der Antike zum Mittelalter.’ Archaeologia Mosellana 1 (1989):pp.89-195. (6). These cemeteries are habitually called Lombard and may indeed have a link, a close link even, to the expression of Lombard politico-ethnic identity. The dating of the material, however, is still to a large extent 'led' by the historical record and an absurdly precise date (568) placed on the opening of this chronological horizon. It would be rare indeed for the archaeological data on its own to be able to make a chronological distinction between material from the last years and immediate aftermath of the Gothic Wars (say 550-568) and the Lombard Invasion under Alboin and fuller understanding may require the uncoupling of the archaeological data from the historical record. (7). There is a whole series of caveats needed here about the patterns of villa excavation but space forbids. Consider them made. [This is the paper I presented at the kind invitation of Prof Martial Staub, at the University of Sheffield last night. My thanks to Martial, Simon Loseby, Charles West and others for their hospitality, and to the audience for excellent questions. Twelve years ago, beating the deadline for the REF census by a week, I published my Big Book of Barbarians. To my disappointment, although it’s a book I am proud of and indeed currently regard as my magnum opus, it hasn’t, in spite of some very good academic reviews, had the impact that I naturally had hoped it would. Partly this was down to pretty minimal publicity by the publishers, and it hasn’t been translated into many other languages unlike its competitors. Partly, though, I suspect it is down to the fact that it doesn’t toe any party line or fall neatly into any sort of historiographical camp. It doesn’t argue for long-term continuity, it doesn’t argue that Rome never fell, or that the fifth century wasn’t an important rupture in European history, but it doesn’t argue that the Fall of Rome was all down to Barbarian migrations or invasions either. Equally it doesn’t argue that there were no barbarian migrations. One of the many reasons I find the historical profession so dispiriting is that people didn’t appear to be able to grasp the argument but tried to shoe-horn it into some pre-existing historiographical niche. So, I have been accused of being an ‘anti-migrationist’, something that I am not, as ought to be clear to anyone with basic literacy reading p.418 of the book and the succeeding discussion about how migrations work. Although, like many others, I have wanted to think critically about the numbers given in late antique sources, I have to my knowledge never even denied that significant groups of people migrated from Barbaricum into the Roman Empire. My argument doesn’t rely on any assumptions about the scale of migration although ultimately that’s unknowable anyway; it can cope with all realistic orders of magnitude. What I have questioned is, firstly, whether these represented the only or even the most numerically significant, population movements in late antiquity and, secondly, and more importantly, whether such migrations were a cause or consequence of, or became a focus for the changes of the ‘long fifth century’. Indeed, to be blunt, while few things in history might be labelled as simply, empirically wrong, I think that the idea that barbarian migrations brought down the Western Roman Empire is one such. Now, if you can parse the logic of that word-salad, good luck to you – you might for instance ask how there can logically be evidence for a counter-factual – but what it appears to be attempting to say is that Roman Empire would not have fallen had it not been for the barbarian invasions. If you are saying that the Empire would have gone on and on had it not been for the barbarian invasions, then you are – very clearly – saying that the Roman Empire fell, ultimately, entirely because of exogenous factors. Why do we so badly need the barbarians to have brought down the Empire? Partly, as I have argued before, there’s – bizarrely – a certain comfort to be had in the idea that the barbarians did it: it frees us from the need to think critical or uncomfortable thoughts about society and politics. The barbarians are just out there and ‘other’, beyond any sort of control; raging, gnashing their teeth, intent purely on invasion and conquest. Simple explanations are always more attractive and they don’t come much simpler than the idea that there was this furious, savage barbarian world opposed to the Roman Empire, which eventually crashed through the frontier and destroyed civilisation, especially when one eschews any explanation for that crashing through. The barbarian invasions are often a bit of a deus ex machina in modern anlyses, even more so when just pushed by an even greater deus ex machina: Huns. Now, with Kyle Harper's work, the Huns themselves need even less explanation, for their migration was itself brought about by another deus ex machina – climate change. So now we have a Holy Trinity ex machina. You’d think on that basis that there’d be some attempt to insert a modicum of nuance into the discussion, especially in this post-truth, ‘we’ve had enough of experts’ age. Sadly not. The arguments have become less subtle but wider-ranging; the evidential sleights of hand more egregious; the wording ever more unsubtle. Lazy references to the results of ‘immigrant violence’; discussions of the tensions of having to live among immigrants, as though this is a natural cause of stress; desperate attempts to pin even change that effectively predates significant barbarian settlement as nevertheless down to barbarian attack, even where the latter is barely evidenced. The repeated use of ‘immigrant’ as a synonym for barbarian – sometimes ‘armed immigrant’. The description of groups that have been inside the Empire for between two and four generations as ‘immigrant groups’ or ‘outside groups’. This is horrible, incendiary – at best irresponsible – language. One book structures its argument around these points: 1: barbarian immigration destroyed the Roman Empire – it didn’t mean to but it did; 2: the end of the Roman Empire was the end of (a) civilisation; and 3: we need to be careful about our own civilisation (note that the first two elements of the book are replete with all kinds of dubious uses of evidence, some of which the author must surely have been aware of); attending Daily Mail-funded festivals giving lectures on how migration brought down the Roman Empire, as part of a strand on the ‘migrant crisis’. The loaded language referred to above, the assumption that people who have never known life outside the Empire, and nor had their parents, and even grandparents, as ‘immigrant groups’ is soaked in assumptions and dog-whistles. This language doesn’t impose itself. I managed to write a 500-page book about the barbarians without using the word ‘immigrant’ to describe a barbarian group more than once (and then to describe a third-century Germanic-speaking Gothic elite moving into what became ‘Gothia’, outside the Empire) and never as a synonym for barbarian; I checked yesterday. (3) This language is a choice. I confess I don’t understand it. I have always found this difficult to square with what I had always got the impression were the perpetrators’ fairly liberal politics. Does one simply not want to alienate one’s book-buying fan-base and kill the goose that lays the golden eggs? If you’re going to pander to them like that, though, you might as well hold their views. Is it some abstracted essay-tutorial idea about ‘winning the argument’? (4) Have these people just not noticed that words have implications and effects? I am convinced that there is a core ethical demand at the heart of historical research. Clearly, bad stuff happens in history; historical explanations aren’t dependent upon ethics. Would that they were. In that case, though, why are these authors refusing to even engage with people who try to bring more nuanced readings of the sources to the table, and indeed being so downright snide about their work? Why are they making their arguments less, rather than more, subtle? With less, rather than more, nuance? Why aren’t they thinking harder about their vocabulary? Why haven’t they at least stated that, although this is how they see the end of the Roman Empire, and that that’s just unfortunately how it was, we ought to be very careful about applying the lessons to the modern world? (I challenged one of them to do so, to no avail.) Or maybe they are happy about all this. As stated, I find this very hard to believe but there comes a point when the evidence begins to pile up… The most charitable explanation, as I have said before, is an incapacity for, or aversion to, serious, sophisticated, subtle, self-reflexive thought. So, the resonance and contemporary importance of the debate on the invasions or the migrations and the role of the barbarians in the end of the western Empire (the Fifth-Century Crisis as I prefer to call it) simply won’t go away. That, the fact that I have changed my mind or developed my ideas about lots of it, and the fact that there’s been huge amounts of new work, especially archaeological, since I finished writing Barbarian Migrations in about 2005 have led me to want to produce a radically revised second edition. I want to do a second edition because there are nonetheless large swathes that I still stand by and I want to keep as they are. I don’t want to keep reproducing the same book under a new title. There’s been enough of that. 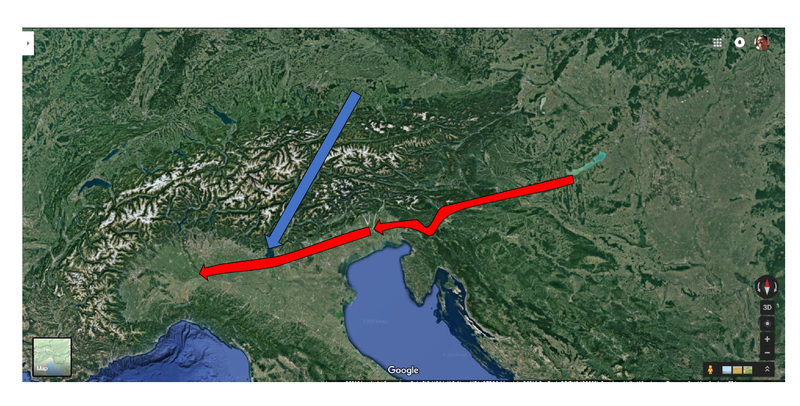 As a focus for some thoughts I want to talk a little about an area that has – quite alarmingly – become a growth area of late: the use of genetics, DNA, to discuss the Barbarian Migrations. I will focus on one particular article that made quite a splash last year (full reference at right: it's open access). It is an interesting and important piece, to be sure, with all kinds of things to think about. 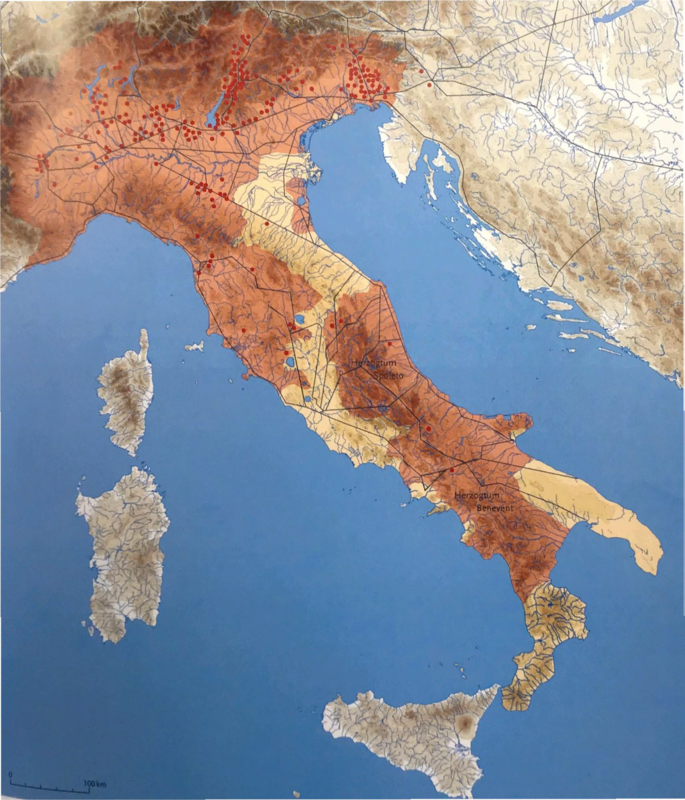 The paper looks at a cemetery at Szolad in modern Hungary, Late Antique Pannonia, and another at Collegno in Northern Italy, areas linked by involvement in the Lombard Migration. It showed that there were discrete groups within both cemeteries which showed different genetic traits, which it related to northern and southern Europe. These groups showed some similarities with different methods of burial and in terms of their diet. When the paper was published, one person retweeted the link with the claim that it showed ‘Peter Heather was right. The Völkerwanderung was a thing!’ Does it? We’ll see. Does it indeed do anything to help us ‘understand’ ‘6th-century barbarian social organization and migration’. Here I will be definitive: no. No, it doesn’t. At all. What it might do is describe a couple of situations where people had moved and one case where people who might have been the incomers used different burial practices, and that’s valuable, if it does that. But if we want to understand that migration we are no further on than when we were at the start, unless (and this is important), the implicit argument is that if migration occurred it must have been ‘barbarian’ and, as we have seen, barbarian migration needs no explanation, and that material culture and social organisation must be explained by migration. Unless, in other words, the fact of barbarian migration is the necessary and sufficient cause for late antique population and cultural change. You can therefore understand, in the current climate, the gushing about how this had proven that the Great Migrations were ‘a thing’. But let’s hold on right there. Let’s have a look at the data. Now, I am not a scientist and make no pretence at being, so I have absolutely no reason to doubt or cast any aspersions whatsoever on the lab science. I have no option but to assume that it was all entirely rigorous and I see no reason to doubt that. And the correlations are interesting. But scientific rigour is about more than lab technique. I want to say at the outset that these data and the correlations are extremely rich in potential implications but that their ability to contribute to our understanding, to use their term, of late antique society has been completely clouded by an unfortunate – I would say quite unscientific – attempt to shoehorn it into a particular narrative, a particular set of presumptions based upon specific readings of the written sources, and a failure to question with sufficient rigour its presuppositions about material culture. The first problem here is that the blue and red dots on this map are not easily identifiable with particular graves. I am assuming that they might be if one went back through the data published in the supplementary documents (which I haven’t had time to do) but it would have been really helpful to have had the graves identified on this diagram for ease of comparison with the kindred groupings showed earlier. This presentation (again a result of deliberate choice) obscures things. As you can see the blue and the red look pretty clearly distinguished. Set against the modern DNA populations, though, it’s not entirely helpful that South-East Europe, Southern Europe and Central Europe are put in more or less the same colour; squinting away at the diagram shows that the spread within these modern populations is nevertheless pretty broad and overlaps quite a lot. (I have tried to indicate the spread through an overlay on the published diagram, above) The means of the three are fairly close together. (Also shown in an overlay, with the area shaded blue.) 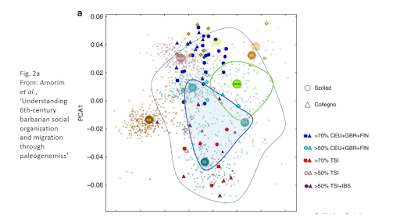 Note too how the modern Hungarian population (lime green on the diagram: this spread again is overlaid onto the published diagram, marked with the lime green line) differs quite a lot from the 6th-century samples. This seems odd given that the authors wish to use the other modern populations as a meaningful background sample to identify local groups in the past. The problems are underlined if you compare the results with the historical DNA samples. If you look at the historical DNA samples from Hungary you will notice not only that they are quite different from those of the modern population of Hungary, but that actually they cover a range that would include most of the ‘blue’ group of putative northern immigrants. (I have overlaid the published diagram, right, with an open blue ring indicating the spread of ancient Hungarian DNA samples, and a shaded red ring showing that spread if one excludes its the outliers). The ‘red’ group of supposed locals, by contrast, is excluded. We’ll come back to that. Note though that there are no historical DNA comparanda from Italy. Why do the authors think that these are, in the case of Collegno at least, locals? Well that’s partly because the red group has most affinities with the modern southern European population. That doesn’t really amount to much given what I just said. Their local status is actually established not by genetics at all but by the strontium content of their teeth. On the other hand, though, it shows significantly different things for Szolad, and emphasises some points made, but played down, in the article. 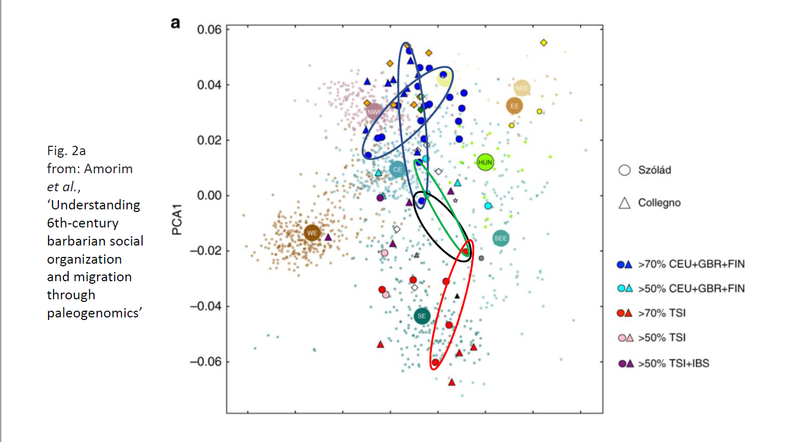 Both blue and red groups there (still blue and red, circles, in the redrawn diagram) are more disparate and both have internal variation that is sometimes greater than the variation between the two groups. Here we seem to have something rather more like a spectrum than two clearly distinct groups, so one is entitled to ask why they have been presented as representing such clearly discrete groupings. The other thing that emerges is the subtle but interesting difference between the 'blue' group at Szolad (circles) and the 'blue' (now 'dark olive') group at Collegno (I suspect a nearest-neighbour analysis would highlight the relative lack of overlap) and, even more so, between the 'red' group at Szolad and the 'red' (now 'puce') group at Collegno. Again, we need to ask why the data are being presented like this? Why present the groups in the same colours, suggesting the same binary, on the two sites? Why, for instance, is the 'red' group at Szolad not being presented as 'purple' like the 'purple' group at Collegno, who seem rather more closely related according to the diagrams above? Why the blue/red binary? What interpretation are we being steered towards? Shading the two groups in the same colours, even while using different shapes, nonetheless works to obscure the differences between the groupings at the two sites. This is important if we are supposed to see the 'blue' group at Collegno as somehow related to that at Szolad. The data seem to permit the possibility that this group had come from somewhere quite different. Another representation of these points. 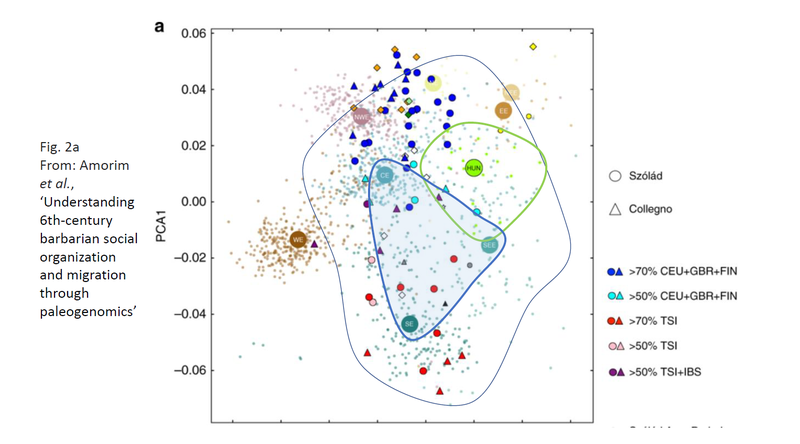 If one were to plot the different graves according to the sort of nearest neighbour analysis suggested above and colour the samples according to some sort of gradient, how different would the diagrams of the two cemeteries' genome samples look? It is also important to remember that deoxyribonucleic acid (DNA) doesn’t have either an ethnic identity or a prima facie geographic signature. When the authors talk about southern or central or north-western European genomes, that is a potentially misleading shorthand for a whole series of statistical analyses, probabilities and judgements, comparing data with ancient and modern samples. Neither sample, at either end of the chronological span, can be claimed to be unproblematic or to have a secure or necessary linkage with specific, precise regions. Whenever one reads about the regional genetic similarities of the subjects of these burials one needs to explode that phrase and imagine someone trying to match a small piece of a jigsaw against the images on two overlaid, but changing kaleidoscopes, neither of which has a hard and fast linkage with any precise geographical location. None of that need matter, nonetheless. Let’s assume (as I must) that the analyses have the techniques to be able to do that and that the stats, in the current state of our knowledge, are significant. The labelling of genomes by European region (and by percentages according to European region) remains problematic, nonetheless. We can however enquire seriously about the extent to which the experiment is being structured by the answers it wants to give. In other words, how good is the science in terms of the setting up of the experiment? 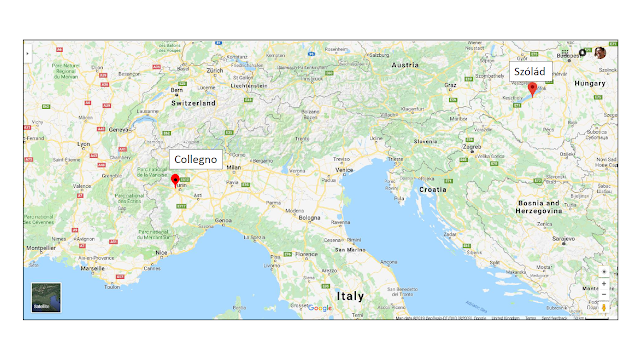 Two samples have been selected from two regions known from historical sources to have been, at some point, occupied by Lombards. (6) Where is the control? Surely, we need a sample either from a period in which, or a place where, Lombards weren’t involved. What if this sort of pattern is typical for cemeteries in the Po Valley, or in Pannonia/Hungary? The historical samples from Hungary gives us reason to suspect they might be. The lack of Italian comparanda gives us no sound basis for judgement one way or the other. Think back to the red group. 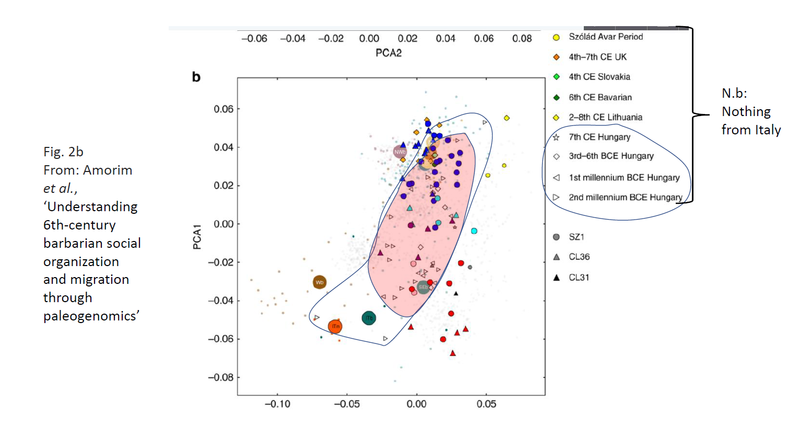 Why is a so-called ‘South European’ group in Pannonia being assumed to represent the local population when, as we have seen, it differs from the general range of historical DNA samples in the region far more than the ‘blue group’. Why aren’t we looking at these as the migrants? 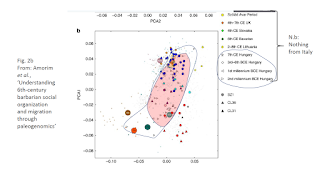 The analysis of the strontium content of the teeth did not seem to suggest that the blue, ‘northern’ group were necessarily more likely to be outsiders than the ‘southern’ red group. 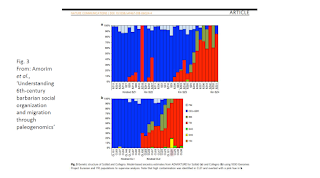 (7) They were, however, evidently more heterogeneous in origin than the red group. 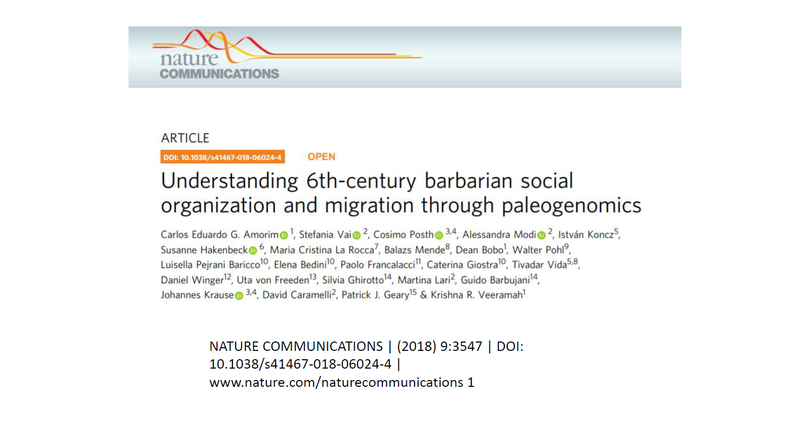 According to the ‘narrative’ the study was supposed to be ‘testing’ barbarian immigrants were heterogeneous, but on what basis would one assume that the population of late Roman Pannonia wasn’t? In Collegno, by contrast, it seems that the ‘northern group’(8) does appear to have migrated into the area recently, unlike the red, which is interesting and very valuable. 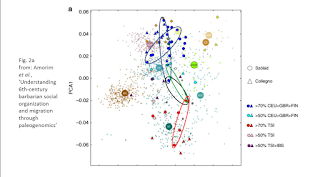 (Note, though, that it doesn’t prove either that the red group had not also been outsiders, but more than a generation previously, or where the blue group had been more than a generation earlier. (9) Indeed, ‘[e]ven amongst the two family groups of primarily central/northern ancestry [sic] there is clear evidence of admixture with individuals with more southern ancestry’.) The conclusions, say the authors, are ‘consistent with an origin of this group east of the Rhine and north of the Danube and we cannot reject the migration, its route, and settlement of the Longobards described in historical texts.’(p.9) Indeed they are, but the problem is that they are simultaneously at least as consistent with an almost infinite range of alternative interpretations and do nothing to render that reading more plausible than the others. In short, we set out with a series of assumptions and the experiment did nothing to rule those out, so we are going to imply that it has confirmed them. This is bizarre. I had always thought that scientific method proceeded by deduction, by ruling explanations out, rather than simply picking, out of a wide range of possibilities, the one that accords with the analysts’ preconceptions on the grounds that it had not been excluded by the experiment. There is actually very little that is ruled out by this experiment, other than the idea that late antique populations were entirely static and genetically homogenous, which I do not think anyone was proposing in the first place. This latter puzzling. 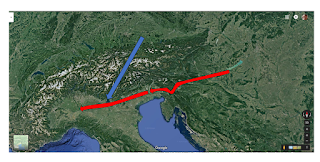 Population movement across the Alps, while difficult and dangerous, has been constant since Ötzi the Iceman Going over the Alps like Ötzi (bue arrow, at right) is not, in any case, how you get from Pannonia to Italy (red arrow) but, even if it were, a cursory glance at Roman history will show numerous fairly large-scale movements of people, whether barbarians or Roman armies, as well as constant traffic across the Alps – and this is crucial – in both directions. This is why a control, or other comparanda, was essential. How likely is it that a sample of any cemetery in the Po Valley, dating to any period between the ‘Celtic’ settlement of Cisalpine Gaul and now, would contain at least some people with genetic make-up suggestive of comparatively recent origins north of the Alps? Would, in other words, have a profile looking rather like this? I strongly suspect that the answer is ‘pretty likely’ at the very least. 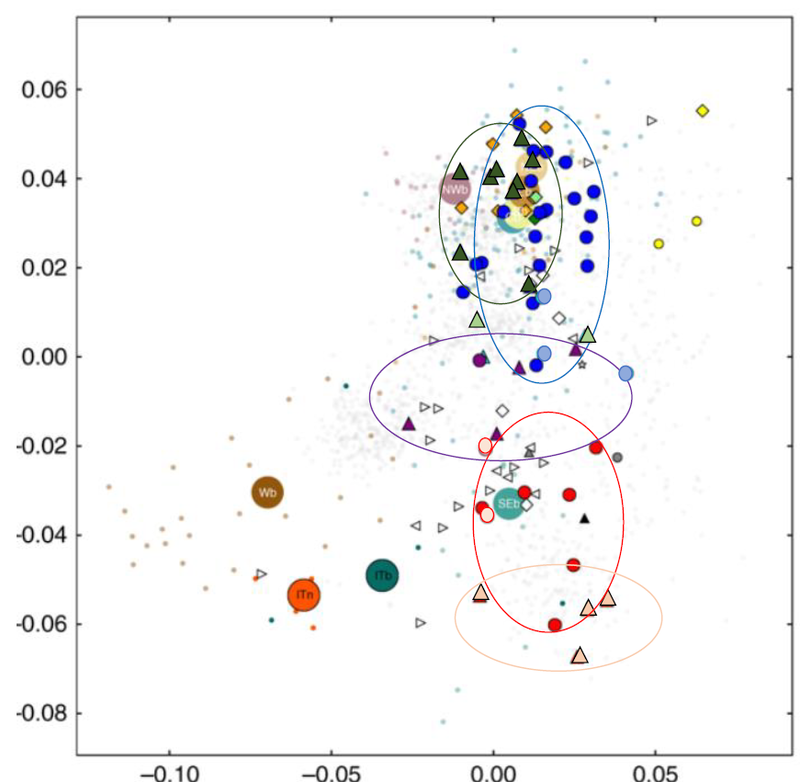 The analyses made no linkage between the incoming group in Collegno and the supposedly immigrant group at Szolad, other than the broad similarity of their genetic make-up when plotted on diagrams 2a and 2b, [and, as we've seen, their similarity is rather less striking than at first seems to be the case, suggesting different origins]. The (modern) geographical regions associated with the blue group are moreover pretty broad, so things are far less precise than they might seem. Think of all the possibilities. If the incomers at Collegno do have, loosely, ‘central European DNA’ could they not be descended from Ostrogoths, or from any of the barbarians who made up Odoacer’s army? For that matter, although growing up in the locality, why can the ‘red’ kindreds at Collegno not belong to either those groups? What if they were descended from ‘Romans’ who had moved back from the transalpine provinces (cp the Life of Serverinus of Noricum)? Even more troubling is the analyses’ conclusion that genetic or biological kinship might underline ethnic identity. It tries to hedge around this but that is clearly the implication. There is absolutely no reason why all of those different kindreds could not have all shared the same ethnic identity. The only grounds for presuming ethnic difference, other than the notion, which the authors make a show of rejecting, that ethnicity is biological and that different genetics mean different ethnicities, is the idea that burial ritual is linked to biology/ethnicity. That assumption is no more than that and finds little support in serious archaeological analyses. 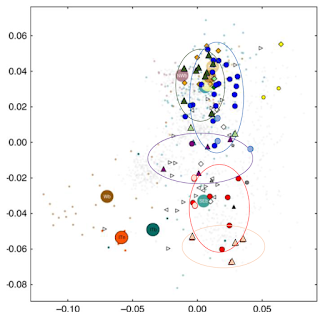 For one thing, the relative furnishing of burials has been linked to age and stage of the life-cycle in numerous studies across western Europe over the past thirty years. At one point the authors of the piece even talk about ‘religious evolution’ at Collegno, wheeling on another presupposition about the meaning of burial rites that has been repeatedly knocked on the head since the 1970s. If the significance of the rite is religious, how and why is it also ethnic? If the idea, which is implicit in this piece, that ethnicity, based on ‘blood’, is sufficient to explain material cultural difference (the second quotation above talks about a 'link'; it does not talk about an explanation: this is elementary), gets any traction, we run the risk of setting back by a generation, perhaps two, the understanding of early medieval western European social history, as analysed through its burial data. There are interesting and enormously important things to ponder about the linkage between kindred, rite and diet demonstrated in these analyses, but they aren’t the ones suggested by the authors and a link is not an explanation. The really disturbing aspect of historical DNA studies in recent years – not necessarily this study, although, as I have just said, it is not free from the problem – is, however, an attempt to link modern regions with historically attested ethnic identities via genetics. The implications of this don’t need to be spelled out. Long-term, ethnic, geographical, genetic continuities are being suggested, not unproblematically, and getting huge media coverage. We are on the verge of turning ethnic identity back into race. We are running the risk of turning the clock back even further in our understanding of society and identity, to a return to 'blood and soil'. I don’t entirely know whether the people working on these projects – generally scientists with a very poor understanding of late antique history and archaeology – have considered the implications of what they are doing. Those out there writing their Amazon reviews deriding ‘sociological clap-trap’ will love this of course but, as the fact that Amazon itself has to hide some of their comments as potentially offensive shows, they are, in the current parlance, ‘gammons’ and they would. The academic community has a duty to be better than this. This is not, as I have been accused by the self-same Amazon reviewers of wanting to do, to cover up uncomfortable data; it is to think harder about those data and what they mean,(11) and to make sure that scientific experiments are driven by cutting-edge historical thinking and set up in rigorously scientific fashion so that they can contribute to debate and public knowledge in responsible fashion. 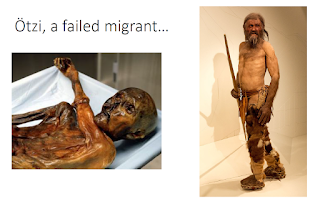 In the time that remains, I want to talk briefly about what – if it were to constitute that sort of research – my revision of the Barbarian Migrations book needs to address. Again, this is not to deny that there were barbarian migrations or that they were an important feature of the period, but an attempt to recast the ‘Fifth-Century Crisis’ that includes the fragmentation of the western Empire and the movement of barbarian groups. It’ll be a list of things we can discuss. This has two important implications. One is that, contrary to the idea that the barbarians had acquired so much wealth from the Empire that they were by c.400 richer, more powerful, and more independent, the opposite is the truth. The collapse of those well-managed relationships around 400 caused, as such things had caused earlier, crises beyond the frontier. As had also happened throughout imperial history, those crises created winners and losers and the losers headed for Rome: drawn as well as pushed; not simply shunted along. But the really surprising thing about the fifth century, as I began to explore in that article, is the fact that the eventual collapse of the frontier, so far from opening the floodgates to mass migration sweeping over the provinces, actually more or less killed off large-scale, long-distance population movement. After the ‘Great Invasion’ of 406, and the Burgundian crossing of the Rhine a few years later, there are really no more great barbarian invasions in the west from barbaricum, until the Lombards. What we have instead is the sort of slow, gradual drift across the frontier, over the Rhine, across the North Sea. What sort of scale this operated on at any one time is difficult to establish but it was very clearly a quite different phenomenon from many of the types of migration that had dominated the Imperial period. As I said in the article mentioned, the dictum I came up with in the 2007 book, that the End of the Roman Empire caused the Barbarian Migrations and not vice versa, is, as I now see it, quite wrong. The End of the Roman Empire was effectively also the end of the barbarian migrations. Remember, the Lombards migrated into a reconquered Italy across a re-established imperial frontier, and the Ostrogoths came from the Eastern Empire. Bizarrely, the Franks seem to have inherited the Roman attitude to the Rhine as a frontier, but in practice the Frankish frontier seems to have been quite different. There are a couple of points stemming from that which I think a revised Barbarian Migrations… needs to develop. The first is to expand the points I made about the human, lived scale of the period, the fact that people get old and they die, that twenty years took as long to happen in the fifth century as they do now. These are, weirdly, points that have not impinged on a lot of the scholarship. But we need to remember that – probably – most of the Vandal warriors who sacked Carthage in 439 had almost all been born, and had grown up, in the Roman Empire. Only those older than 33 would have been born in Barbaricum. How many actually had any meaningful memory of life outside the Empire? Geiseric, the arch-Vandal of so many narratives, was almost certainly born on Roman soil. So, probably, were all the leaders of the (Visi)Goths after Athaulf. By 414 that group of Goths – if, that is, they were related to those who crossed the Danube in 376, though perhaps not all of them were – had been in the Empire for thirty-eight years. Theoderid, killed in battle in 451, is unlikely to have been older than seventy-five at the time. The warriors who followed Euric in the late 460s and 470s, as well as being born in Gaul, were probably the children of Goths born in Gaul, and grandchildren of people born either in the Balkans or en route across Italy or Spain. The Burgundian warriors famously mocked by Sidonius, if young warriors, had probably been born in Sapaudia, likely sons of men born elsewhere in Gaul. And who were their mothers? Likely provincial Romans. These men, of these generations, Burgundians, Vandals, Goths, are those referred to as ‘immigrant powers’ or ‘outside groups’ by Peter Heather on p.435 of The Fall of Rome. What assumptions lead one to call a second-, third- or even fourth-generation provincial Roman, even one also deploying a Gothic, Burgundian or Vandal identity, an immigrant or an outsider? Referring to such people, still, as immigrants or outsiders might well of course be simply lazy rather than ominous, a basic failure to remember the biographical details of such ‘barbarians’ (just as Heather forgets the biography of Emperor Honorius, whom he calls an 'infant' in 406, when he was actually 21). That however is all the more reason to emphasise them, when assessing the role of soldiers and leaders who held non-Roman identities in the fragmentation of the Empire (an issue of such contemporary importance). Identities are not entities; they are not essential or immanent. As I argued recently, they are wagers; the section on identity is another part of Barbarian Migrations in need of a rewrite. Growing out of that is another point that needed developing in the first edition: that the Fifth-Century Crisis is not about Barbarian Invasions but above all about factions and civil war. Those factions are regional alliances between soldiers and their commanders, with barbarian identities – as many of the fourth-century Roman army had already deployed – and provincial Roman aristocrats. We need to rethink the assumptions that bedevil the discussion of provincial politics: that the barbarian soldiers had the whip-hand and were the leaders, that they were seeking to create independent kingdoms, and that people knew or even thought that the western Roman Empire was dying in the fifth century. A key change I will make to the book is abandoning the idea that in the 470s people knew the Empire had fallen. They clearly hadn’t, and they didn’t until Justinian’s Wars in the mid-sixth century. People very clearly, I think, knew something had gone badly wrong in the 470s and that the pars occidentalis was no longer functioning as such, but I can see no reason to think that they knew it was never going to make a come-back. What exactly was a ‘king’ in the fifth-century west? We need to stop thinking about this through a medieval lens and think harder about what the ‘courts’ of barbarian ‘kings’ meant in the fifth century. As I have said before, kingdoms were for losers. The intention of all the factions that we can identify, was to gain control of the Empire, on the fourth-century model and, for generals, barbarian and Roman, on the model of Stilicho. Those that managed to control the imperial centre – Ricimer and Gundobad for example – did not use the title king. Wherever we can make the comparison, military and civilian elites are in cahoots and evidently equals. Above all, though, what the fifth-century crisis is about is Christianisation. This is the gaping hole in Barbarian Migrations and the Roman West. (13) Survey pretty much any body of evidence from the fifth century and you will find that the narrative it tells you is not about barbarian migrations or invasions and the end of the Roman Empire but about the encroachment of Christianity into all areas of life. What is happening, as part and parcel of the politics I just referred to, or hand-in-hand with it, is a reorganisation of the ways in which people organised the world, from one with the civilised Roman male at the centre and barbarians as one of the elements that circled around that, with the civilised Roman male as the ultimate manifestation of legitimate authority, to one where the legitimate centre was defined by religious orthodoxy, correct belief, and the outside by heresy. The stories of the barbarian migrations and the end of Rome, and of fifth-century western Christianity have too long been studied separately so that they appear to be contemporary but somehow running on different tracks. I think though that the two are far more intertwined than we have thought, even in Peter Brown’s recent(-ish) books. Finally, in Brother Bobby’s words, ‘I got one more thing I’d like to talk to y’all about right now’. And it is the last aspect of the book that I want to develop – again something that is there, and to a greater degree than in other books, but which needs expansion – is a further return to the human scale of the history of the period. Where do all of these things intersect – identities of various sorts, religion, politics, community, the ironies of political narrative – if not in gender and the family? The very basic structures or environment into which the historical actor is ‘thrown’, if one can use a Heideggerian term without being suspected of advocating a return to Blut und Boden. Julia Hillner kindly tweeted that I was one of only a few people who crop up in bibliographies on the End of the Roman World and The Roman Family. Those two areas do – like Religion and secular politics, economy and society – need to be put together. In Barbarian Migrations I concluded by saying that I was trying to put people back into their history, but I think that there was more that could be done there, and above all I do think that that has to be done if one is going to get at what the changes from a series of Roman provinces to a congeries of accidental barbarian kingdoms was really about. We really need to put migration into a much more rounded total history of the fifth century rather than prioritising it as an explanatory focus. It has been a long time since the story of the Fifth-Century Crisis has mattered, politically, as much as it does at the moment. It matters that we think hard – harder – about it; it matters that we get our approaches right; we need less concentration on argument and rhetoric, on winning debates, and more on understanding and hermeneutics(14); it matters above all that we do it better. 1: My anger about all this is justly infamous but has been badly misrepresented. I do think that some things are worth getting angry about, and the misuse of the Barbarian Migrations and the End of the Roman Empire to fuel xenophobia and racism, and the way some modern authors pander to this, is one such. However, to look at the origins of this ire and animus, I invite you to compare my engagement with Peter Heather’s work in Barbarian Migrations, and its tone, with Heather’s engagement – if you can call it that – with my work, and its tone, in Empires and Barbarians. I never expect to be agreed with; I do expect basic academic courtesy to be reciprocated. If people see fit to treat me intellectually as a second-class citizen, the gloves will come off. That may stem from my own biography as (unlike so many) a first-generation academic not educated at the 'right' schools and universities, but there we are. I will be leaving the profession within the next four years (well done, guys) so I have nothing to lose by not apologising for that. 2: Check out the reviews by someone who writes as 'E.L. Wisty', a walking illustration of the Dunning-Kruger Effect. Also a sadly typical illustration of how little regard the historical profession is held in by hobbyist 'know-alls'. 3: I wondered whether I had been hypocritical about the use of the word 'immigrant' so searched for 'immigra' through all my Word files for the book. It is used principally in the discussions of ethnicity theory, migration theory and references to modern politics and in considering how one might identify an immigrant archaeologically. Beyond that it hardly appears at all: twice in total in all the narrative chapters. I don't recall trying hard to avoid its use. 4: This is a bugbear of mine at the moment, which I want to blog about: the way in which a particular type of 'brilliant', rhetorical argumentative style, fostered in the educational establishments that furnish us with our top politicians has come to dominate British politics and broadcast journalism. It's a style that eschews subtle or deep thought or reflection and we need to address that. It has done the nation a great deal of harm and precious little good, especially of late. 5: Another issue that I was unable to elucidate is why grave Sz19 is listed as part of a 'blue' kindred. 6: Assuming the Lombards who moved to Pannonia and the Lombards who left were still significantly the same groups of people. This appears not to be addressed. 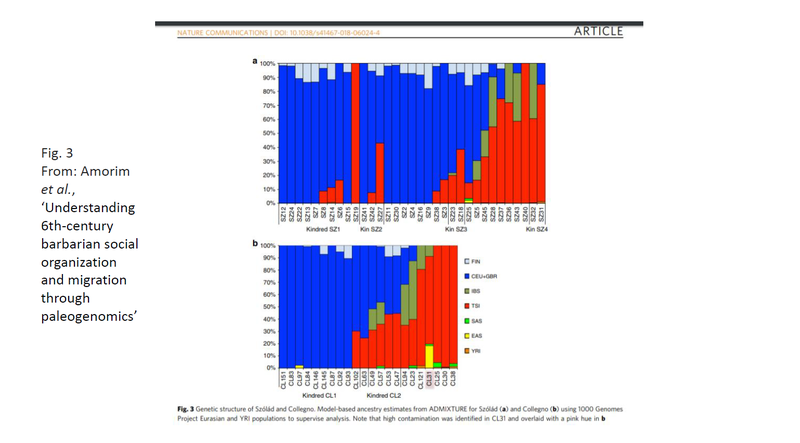 7: This would tally with the considerably less discrete genome signature of the 'blue' and 'red' groups at Szolad. 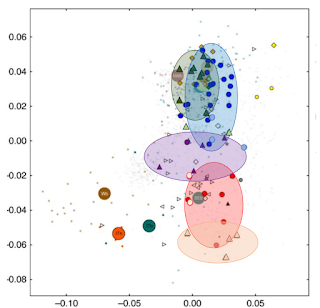 9: Remember that the genomes do not forcefully suggest that they originated in the same part of the world as the 'blue group' at Szolad. 10: One of the problems seems to stem from the fact that although the team included a couple of historians who are (though less so than is sometimes thought) progressive in their interpretations, the archaeologists involved are much more traditional. The absence of a specialist in more rigorous analyses of cemeteries was felt in the contradictions within the published argument. 11: The article under discussion shirks badly on hard, clear, rigorous thought. I was enormously disappointed by it. The word on the street was that it was a real game changer which would force us to rethink all sorts of things. In the end it's intellectually sloppy, like so much 'historical science' coming out of the USA these days. 12: It is a matter of urgency to think about the links between the dominant, 'core' part of the world and its dependent subsidiaries, and the responsibility of the former for what goes on in the latter. It is by no means 'ridiculous presentism' (sorry, David Alvarez Jimenez, but you really aren't the sharpest knife in the drawer) to see that this mattered in Late Antiquity as much as in the modern world and that we need to internalise that for all our sakes. 13: The same gap can be found in the roughly contemporary books by Peter Heather and Bryan Ward-Perkins of course, but with much less importance. It matters far less to the arguments they make and indeed in Ward-Perkins' case, he is arguing that there has been too much concentration on religion. 14: See note 4 above.